It is believed that no two snowflakes are alike; they are pure, beautiful and unique, just like you and your fiancée’s love for each other. The snowflake is used as a traditional motif during the winter months. So why not choose a snowflake theme for your winter wedding? A snowflake theme can be as formal or casual as you desire, it all depends upon the choices you make with your announcements, decorations, cake and attire. Choose light blue, silver and white as your bridal colors. 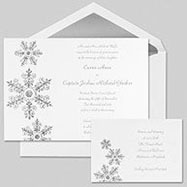 Choose a winter white card stock with a pearlized embossed snowflake boarder and a silver foil envelope flap for an elegant snowflake wedding theme. If you want to send your message in a more casual way, choose a light blue card stock with snowflakes surrounding the wording of your invite. Here’s where your imagination and creativity have no bounds. Ceremony Your ceremony is the first place where your snowflake wedding theme will be apparent. Make end of pew bows using 2 inch white satin ribbon, tie a silver snowflake to the bow using light blue thin ribbon. Have your programs printed on paper with a snowflake design. If money is not an object, begin your walk down the aisle with a personalized monogrammed aisle runner with snowflake appliqués. Have your flower girl drop frosted snowflakes made from card stock, instead of flower petals. Surround your centerpieces with snowflake confetti. Have your reception hall sparkle by hanging silver snowflakes, tied with light blue ribbons from the ceiling. Snowflakes can be purchased at any craft or dollar store. Ask your florist to place glittering snowflakes in your centerpieces, along with your fresh flowers. Use table numbers made from sparkling snowflakes. Gone are the days of the plain white cake. 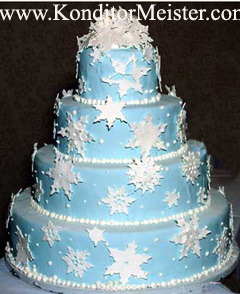 Today you can create a cake to go with any theme and a snowflake wedding theme is no exception. Look through cake magazines and bring a picture of your favorite snowflake cake to your baker so they can make your dream come true. 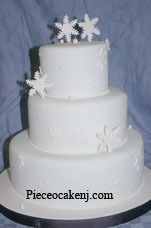 Top off your cake with a beautiful snowflake cake topper. Your guests will love a snowflake shaped wine bottle stopper favor. These candle favors will not only dress up your tables, they will also create a romantic glow to your wedding reception. Snowflake bookmarks are practical and your guests will think of you whenever they are reading one of their favorite novels. I’ve seen lovely snowflake picture frames in the craft stores that will delight your guests. If you really want to be creative, put a picture of you and your hubby in the frame. Imagine the surprise your guests will have when they unwrap their favors. 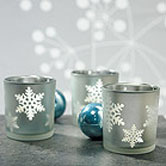 Purchase mugs with a snowflake decal and wrap candy in light blue shimmery paper. Add a custom touch by tying the bundle of candy with monogrammed ribbon. Choose a winter white wedding gown and carry a bouquet with snowflakes placed among the flowers. Have fine shimmery white snowflakes embroidered on the bottom of your veil. Purchase snowflake earrings for yourself and your bridesmaids. Does this picture say, "snowflake" or what? 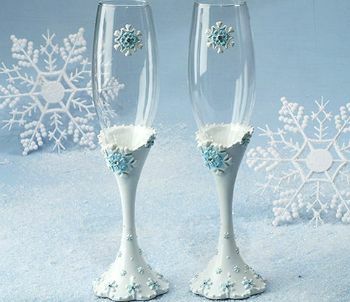 How about you and your honey toasting each other during your reception using these unique snowflake fluted glasses. They can be purchased at Best Bridal Prices. See below. Just like no two snowflakes are alike, no two weddings are alike. If you’re choosing a snowflake wedding theme consider all of my ideas and check out my winter wedding theme ideas on the link below. Are you in need for some unique bridal ideas? Take a look at our Welcome page.